Lionel Alfred “Todger” Hamblin was born at South Hamlet, Gloucester, in 1891, the third son of Thomas, a railway servant, and Ellen Hamblin. As a boy he lived at 17, Llanthony Road. Like his four brothers, he found employment as a labourer at the Gloucester Railway Carriage and Wagon Company Ltd. He started to play for the Gloucester Second XV in 1909-10. On 25th February 1911, there was a fixture at Abertillery, but most of the First XV had to leave that morning on their way to France for their ground-breaking fixture at Toulouse (including Lionel’s brother, James), so Lionel was called up for his First XV debut in a makeshift side, which was not disgraced by the 3-14 defeat, but it was his only appearance that season. Lionel made his debut for Gloucestershire against Monmouthshire at Abertillery on 3rd October 1912, and scored a try. He went on to play in all eight County fixtures and was given some place kicking duties. In the Championship, Gloucestershire struggled to qualify from the South West group, but they squeezed past Hampshire 9-8 with a penalty kicked by Lionel, and in the decider against Cornwall – “Hamblin responded with the try of the match – he picked up a loose ball, punted high, chased hard, robbed the Somerset fullback, and fought his way over the line”, and Gloucestershire won 15-11. Midlands were beaten 6-0 in the semi-final, which led to the final against Cumberland at Carlisle. Lionel figured prominently with a try, a conversion and a penalty in the 14-3 victory which gave Gloucestershire their second Championship. He also played for the County against South Africa, a match which was lost 0-11 at Bristol on 29th December 1912. 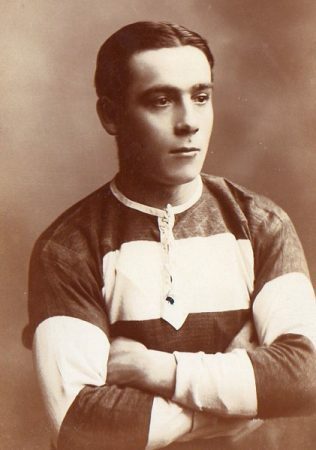 Early in the 1913-14 season, Lionel scored a hat trick of tries in a big win over 1st Gloucestershire Regiment, but perhaps the highlight of his season came on 4th October 1913, when Gloucester travelled to play at Twickenham for the first time, against a Harlequins side regarded as the strongest in England, and came away with what was described as “a famous victory”, 8-0, all the points coming from two dropped goals kicked by Lionel. A month later, he scored the try and penalty which beat Cardiff 6-4, and before the end of the year he scored the try, conversion and penalty which saw off Cheltenham 8-0. Lionel won four more County caps in 1913-14, and drop kicked a penalty to secure a 3-3 draw against Devon, but Gloucestershire had a relatively poor season and failed to qualify for the later stages of the County Championship. Assessing the season as a whole, WB reported that “Hamblin’s individuality was a striking feature of the play of the third line, but it must be confessed he overdid it to the neglect of his colleagues. Of Hamblin’s ability as a footballer there can be no question, and he was thought so much of by one or two of the International Selection Committee that he was picked for trials and appeared in part of one game – England v The North Just about that time the City player suffered with a damaged leg, and this injury no doubt affected his further progress.” This trial was played at Gosforth on 20th December 1913, and Lionel played only part of the game for the North, who lost 8-11. This proved to be the peak of his representative career, with war intervening to put a stop to such opportunities for the next five seasons. At the start of the Great War, Lionel enlisted with the Gloucestershire Regiment in September 1914. He landed in France in March 1915, qualified as a Battalion Grenadier, and was promoted to Lance Corporal in 1916. His Victory Medal is on display in the Soldiers of Gloucestershire Museum, Gloucester. During the war, he played for the undefeated 5th Gloucesters XV, and helped his Company to win the Inter-Company Cup. Back in Gloucester for the start of the 1918-19 season, Lionel turned out for the Club, but many players were not yet available after military service, and many fixtures were not regarded as counting towards Club records. When a full Club fixture list resumed in 1919-20, Lionel scored in each of the first eight matches and was selected regularly for the first half of the season. He was reported to have “played some fine games before Christmas,” and his best was thought to have been against Oxford University, when he kicked two penalties in the 9-5 victory, “but he fell off completely in the second half of the season and was left out of the side.” His career with the County also picked up again to start with, and he played in the three group matches against Devon, Somerset and Cornwall, scoring a try against Devon, but he was left out of the team for the knock-out stages as Gloucestershire went on to win the County Championship. He came back for a few Club matches, but made his final appearance against Leicester on 13th March 1920, before he went north to turn professional and play Rugby League for Rochdale Hornets. On 24th May 1920, Lionel married Lilly Goddard at St Nicholas Church, Gloucester, and they had three sons and one daughter. At the time of his death on 12th February 1944, aged 53, Lionel was living at the Colin Campbell Inn, Llanthony, Gloucester, and he is buried in Hempsted churchyard. Lionel’s brother, James (1886-1948), a centre, also played for Gloucester between 1908 and 1913 making a total of 101 appearances for the Club, fifty-seven of which were for the First XV. James also fought as Private 11506 in the 7th and 13th Battalions, Gloucestershire Regiment. He initially fought at Gallipoli but was wounded and after treatment and recuperation in an Egyptian hospital was transferred to the Western Front and served in the Ypres Salient. James died in Gloucester in 1948.